Details of work in which IATL is involved; see our 'outputs' page for the outputs of our work. See 'Funding' to apply for funding or see details of IATL-funded projects. This project seeks to identify and promote pedagogic practices which improve students’ wellbeing and mental health awareness and which can be embedded in the teaching and learning environment. The project, led by Dr Elena Riva and Victoria Jelicic (both IATL), with Sarah Ashworth (Head of Mental Health & Wellbeing Support Services), has received Warwick Innovation Fund support. 'Sport, Philosophy and Practice' is a project which has explored the gaps and overlaps between philosophy and sport, asked how and where the curricular and extra-curricular intertwine, striven to adapt academic assessment to take into account embodied learning and expression, and reflected on best practice in the creation and development of interdisciplinary and physically active modules. In this playbox you will find ideas to help you play and be playful - at work, at home, in meetings, in the classroom, when planning events. These resources arise from work on The Dark Would project which was founded and developed by people working in roles as students, administrators and teachers. As a result, these resources are inclusive: they're intended for people who teach (understood in the broadest possible sense), people who support teaching and learning, and learners themselves. In a university, that should be all of us. The Dark Would is a collaborative and transdisciplinary teaching and learning project which was established in May 2014 and is based at the Institute for Advanced Teaching and Learning (IATL) at the University of Warwick. To facilitate investigation into this area, a physical installation - also referred to as The Dark Would - has been created which allows experimentation with creating transformative spaces which challenge traditional forms of teaching and learning. IATL staff are working closely with colleagues across the University in the Centre for Interdisciplinary Methodologies (CIM), the Centre for Cultural Policy Studies and the Academic Technology Team to develop ideas within the Digital Humanities. See, for example, the IATL-funded Strageic Project run by Dr David Beck of the Academic Technology Team: Teaching the Digital Humanities at Warwick. IATL is also working with Monash University, beginning a collaborative international dialogue based on outstanding examples of Digital Humanities research and practice at both universities. In May 2014 IATL and colleagues at Monash jointly hosted an event called 'Making Sense of Digital Humanities', videos of which are available to view online; an Insite news item was also written about the event. 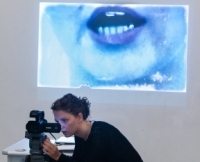 The Emerge Festival and Laboratory, first held in 2014, features graduate theatre companies (including Barrel Organ, Dumbshow, Fat Git, FellSwoop, Kill the Beast), alumni practitioners (including producers Emma Beverley and Ric Watts, performers Lotte Allen and Tom Syms, writers Sam Gayton and Lulu Raczka) participating in events and experiments. The programme showcases and develops the work of the IATL Student Ensemble, in collaboration with the Warwick Arts Centre. IATL is currently developing a series of pedagogic projects that respond to the Medical Humanities movement. This involves "a variety of disciplines that explore the social, historical and cultural dimensions of scientific knowledge, clinical practice and healthcare policy" (Wellcome Trust website), and examples include the new IATL postgraduate interdisciplinary module 'The Medical Mind in Literature and Culture' and the AHRC-funded 'Beckett and Brain Science'. See also the report by Dr Ria Dunkley Building Bridges for Education for Sustainability, which focusses on the potential to expand Education for Sustainability (EfS) related activities at Monash and Warwick Universities, through the Monash-Warwick Alliance. IATL team members are a key part of the new Enterprise Partnership which was launched at the IATL-led event ‘Making Sense of Enterprise Education’ on the 6th of February 2014. The Partnership aims to foster relationships and provide advice, guidance and support for all those interested in enterprise across Warwick. The new Enterprise Partnership www.warwick.ac.uk/enterprisepartnership is the virtual space through which those interested in enterprise should start their journey. Also, related to enterprise are: The Humanity Online Project, which is developing a web platform to facilitate the collaborative understanding and addressing of issues; SIBE, a media organisation involved in The Humanity Online Project which seeks to establish the mechanism to produce solutions-oriented media, and which was involved in organising a Hackathon at Warwick in collaboration with Dr Sara Kalvala and others working on the IATL-funded project Hackspace Warwick; Kristina Donauskyte's IATL-funded project One Step at a Time, featuring the use of a live TV show to facilitate the creation of a web platform for campaign collaborations. IATL is involved in the planning of the new £15m teaching and learning centre to be sited on Tocil Field, drawing on our experience of the refurbishment of the Ramphal Building in 2012. Subject to planning permission, construction should start later this year and the first phase should be complete by late 2015.